Still lifes involve painting or drawing a prearranged composition from various items that can be found around the home or even outside. My still lifes use house hold items; most of my pieces are drawn with soft and oil pastel on watercolor paper, but I also use gouache, watercolor, and acrylic paints. All works are framed with a standard picture frame. My style is realistic; however, I also deep hues of cool blues and warm splashes of yellows, oranges and reds. Dimensions for my still life pieces vary but do not exceed 24 in x 24 in. 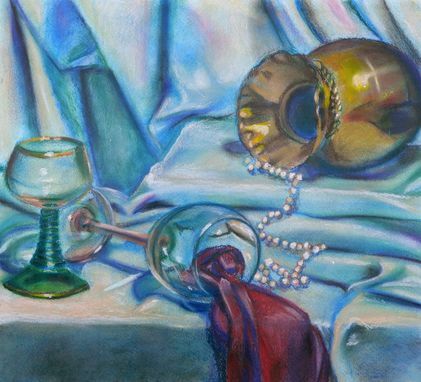 This still life, "Emptied" is approximately 17 in x 18 in.